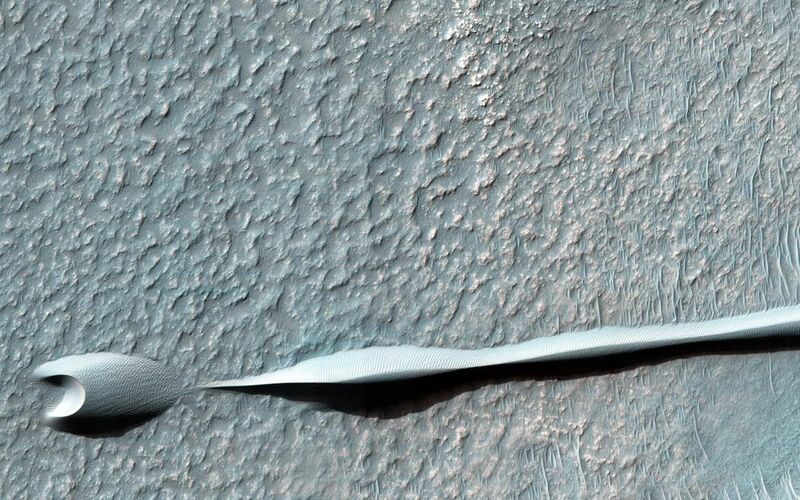 Sand dunes such as those seen in this image have been observed to creep slowly across the surface of Mars through the action of the wind. These are a particular type of dune called a "barchan," which forms when the wind blows in one direction (here, east to west) for long periods of time. Barchan dunes are common on Mars and in the desert regions of the Earth. 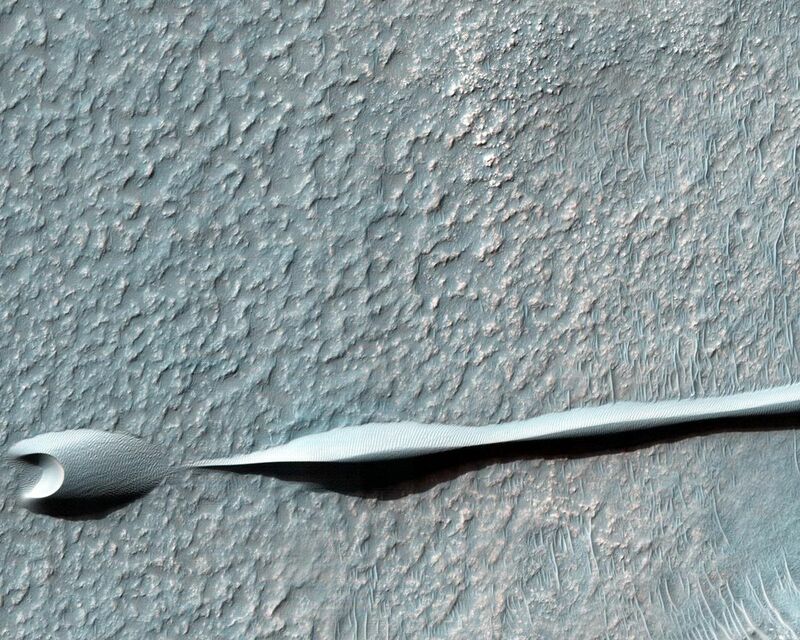 These barchan dunes are located on the western rim of the Hellas impact basin, in the Southern hemisphere of Mars. This area is covered by extensive deposits of layered rocks that were initially deposited as loose sediments and over time formed these rock layers. Portions of these layered rocks were subsequently eroded away and the remaining layers now form numerous flat-topped hills called "mesas." The barchan dunes are forming in the lee (downwind) of the mesas. This area was previously image by HiRISE in 2008 (PSP_007676_1385) and was retargeted here through a public request (http://www.uahirise.org/hiwish). 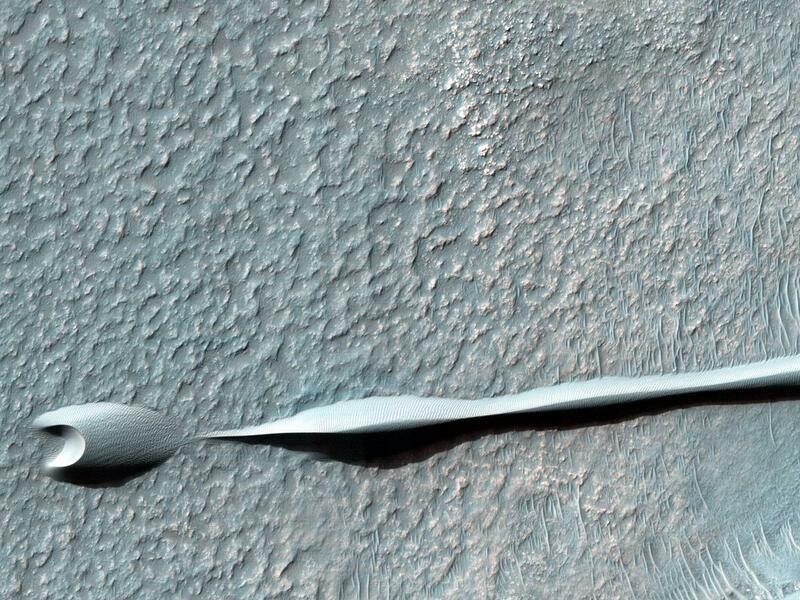 Careful comparison of repeat images such as these can reveal the speed and manner by which dunes move across the Martian surface. This information can be used to study the current atmosphere of Mars, the age and mobility of sand deposits on the planet's surface, and the hazards that sand dunes may pose to landed vehicles such as rovers. Over the course of its mission, the science instruments on board the Mars Reconnaissance Orbiter (MRO) have returned over 200 terabits of data back to Earth. This image was taken on November 4, 2013, the same day that MRO's 200-terabit mark was surpassed.